Is Ed Miliband a drag on Labour’s support? Ed Miliband’s rising approval figures in the polls have led to some reassessment in the commentariat. A lot of it is predictably rather coloured by wishful thinking – with some honourable exceptions there are a lot of right-wing commentators who are still convinced that he is a leader who the voters do not see as up to the job and that this is an almost insurmountable obstacle to Labour, and a lot of people on the left who think he is either now the apple of the public’s eye, or that perceptions of the party leaders are at most a side issue, if not entirely irrelevant to how people vote. At the extremes both are wrong – people who say that it is impossible for Labour to win with Ed Miliband are wrong, the leader is but one factor in voting intention and there are clearly many others. It is perfectly possible for a party to win despite having a duff leader. It would be equally wrong to say that leader perceptions are not a factor at all – we can be relatively certain from key driver analysis of recent British Election studies that perceptions of the party leaders are a major driver of voting intention. It is as much wishful thinking to dismiss the problem for Labour as it is to pretend the problem is insurmountable. Let’s first try to identify the problem. It is easy to cherry pick good and bad results for party leaders, all politicians have strengths and weaknesses. For example on the up side Ed Miliband is seen as the most in touch of the party leaders, is far more likely than the other party leaders to care about the problems of ordinary people and often leads when people are asked how well the party leaders are currently doing at their jobs. On the downside, he is also seen as weak, not up to the job and people don’t think he looks like a potential Prime Minister. All of this adds colour and understanding to WHY a party leader is seen positively or negatively, but doesn’t get us to the core question of whether they are a positive or negative for their party. Let’s see if we can find some questions where we really can benchmark a leader against their party. First there is the comparison between leader ratings and voting intention. Labour have a lead of around about 10 points in the polls, and yet David Cameron has a lead of around about 10 points as best Prime Minister. It is perfectly normal for the governing party to do better in Best PM than in voting intention because the sitting PM has the benefit of incumbency (it’s easier for people to see them as Prime Minister), but this is an unusually large gap. Below is the Conservative poll lead (or deficit) since YouGov started regularly tracking both figures in 2003, put alongside the Conservative leader’s lead (or deficit) on the measure of best PM. You can see IDS lagged significantly behind his party (on average he was doing 16 points worse than his party). Things improved under Michael Howard, who only lagged 7 points behind his party. That shrunk to 5 point when David Cameron took over and once Gordon Brown replaced Blair the Conservative lead in voting intention was almost identical to the Conservative lead as best Prime Minister. Now look at what happens once Ed Miliband takes over as Labour leader. Labour are the opposition now so the lines are reversed as we would expect, but look at how far Miliband lags behind his party. The average gap is 18 points. Let’s take another measure, Ipsos MORI have a great question on whether people like both the party and the leader, like the party but not its leader, like the leader but not his party, or don’t like either of them. Tracking data for it is here. If you look back to the last Parliament people consistently said they liked the Labour party more than Gordon Brown (in April 2010 43% said they liked Labour, but only 37% liked Brown) – he was a drag on his party. With David Cameron it was the other way round, in April 2010 53% said they liked Cameron, but only 38% liked the Tory party. 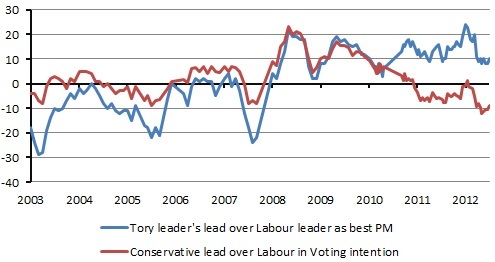 Cameron was a positive for his party (note that even then more people liked the Labour party than the Conservatives!). MORI have only asked the question once about Ed Miliband, well over a year ago, but ComRes asked an almost identical question this April. They found that David Cameron’s advantage over the Tory party had vanished, now 37% of people liked the Tories, 38% liked Cameron. Ed Miliband’s figures though looked worse than Brown’s – 45% of people said they liked Labour, but only 22% said they liked Miliband, so he trails his party by 23 points. A majority of people who said they liked Labour said they didn’t like Ed Miliband. Another straw in the wind, back in May YouGov did a hypothetical poll asking how people would vote if Boris was Tory leader at the next election. As a control, they asked how people would vote at the next election if the party leaders remained David Cameron, Ed Miliband and Nick Clegg. The result was that a normal voting intention figure of CON 31%, LAB 43%, LD 9% became CON 32%, LAB 40%, LD 10% once you mentioned Cameron, Miliband and Clegg as the party leaders. But even if Ed Miliband is less popular than the party he leads, does it matter? The first thing to note is that these opinions are already there, they are already factored into Labour’s price, and yet Labour are ahead by 10 points. Clearly Labour are perfectly capable of getting the most votes with Ed Miliband as their leader. However, that doesn’t mean Ed isn’t costing the Labour party votes. Just because Labour have a good lead in the polls, doesn’t mean they couldn’t have a bigger one. Going back to that ComRes poll, 82% of people who say they like Labour AND like Ed Miliband who were asked their voting intention said they’d vote Labour tomorrow, amongst those who like Labour but do NOT like Ed Miliband that figure falls to 61% of people. While Labour have a ten point lead in the polls this doesn’t matter that much. I doubt Prime Minister Miliband would arrive in 10 Downing Street, throw himself on the bed and cry himself to sleep because no one likes him and he only won by 10 percent points. However, mid-term opposition leads in the opinion polls have a tendency to fade as elections approach and a nine-or-ten point buffer mid-term may be far less comfortable come polling day. What should be far more worrying to Labour is if things like leader perception becomes more important closer to elections. We all know the pattern of mid-term term blues, of oppositions doing better in the middle of Parliaments in the polls and in mid-term elections. Well, why is that? Part of it is due to the actions of political parties. Governments do unpopular things early in the Parliament and save nicer more populist things for the end of the Parliament when they need the votes. Oppositions are policy lite early in the Parliament and paint themselves as all-things-to-all-men, later on in the Parliament they must come off the fence and disappoint some people. I suspect part of it though is how people think about voting intention and answer polls – right now I suspect a lot of voting intention is simply disapproval of the government, telling a pollster you’ll vote Labour is the way people indicate their unhappiness with the government. As we get closer to an actual general election it becomes more of a choice of alternative governments – which one would I prefer? The reason that Ed Miliband lags behind the Labour party in polls is because there are a substantial number of people who say they’ll vote Labour, but on other questions say they aren’t sure who would be the best Prime Minister, or which party they’d trust most on the economy. It suggests that support may be pretty shallow and liable to fade once the general election approaches. Of course, there is plenty of time until the election, time to firm up that support, time for, as the vernacular used to be in the last Parliament, for Labour to “seal the deal”. In short: is Ed Miliband a drag on Labour? Yes, he probably is. Can Labour win with him as leader despite that? Yes, it is certainly possible. Will he become even more of a drag as the election approaches and minds are focused on choice of government, rather than anti-government protest? The jury is still out. I agree with The Sheep – who gets to decide which groups are ‘experts’ and which are essentially interest groups? How do you stop multiple organisations which represent the same interest and if there are multiple organisations, how do you choose which one represents the interests? If you have a minimum threshold for ‘mass organisation’, what happens when one organisation (example, the TUC – 6.4 million members) has more members than another (RSPB – just over a million) – you end up with the ‘rotten borough’ problem, so weighted votes? And how do you protect against one person being a voting member of multiple groups? If that happens you end up with ‘one man, many votes’. If you have to buy yourself membership, then the richer you are, the more memberships you can buy. If you give each citizen one vote, to fix that issue, you might as well go full PR – but with each citizen choosing an ‘organisation’ to back, rather than a party. The purpose of the primary chamber is to represent the people – the fact that it elects the executive is only secondary. If the HoC is just there to elect the executive and not provide a balance of power against it, then we might as well abolish it as it serves no purpose. The HoC isn’t primarily an electoral college, it’s a legislative chamber. Also, I do note that the HoC effectively often works not as a balance of power but a rubber-stamping exercise – but that isn’t it’s purpose (de-facto vs de-jure). The executive in a parliamentary system is supposed to work for the parliament, not the other way around. And I should note the pre-amble of the Parliament act’s restrictions on the Lord’s power. It justifies granting supremacy to the Commons solely on the phrase, “whereas it is intended to substitute for the House of Lords as it at present exists a Second Chamber constituted on a popular instead of hereditary basis, but such substitution cannot be immediately brought into operation”. The Parliament Act was solely intended as a compromise giving supremacy to the commons, until an elected second house could come into being. Anyone who says that Commons supremacy is fundamental to the constitution of the UK is entirely incorrect. The principle of the Parliament Act was to give Electoral Mandates supremacy, not enshrine the Commons as a unicameral supreme legislature. Those who argue against Lords Reform on the basis that the Commons must naturally retain supremacy do so from a platform of historical ignorance. It all feels like the AV debate all over again. People using arguments against the policy while actually arguing against something different. If the purpose of the second house is to essentially be a panel of experts then you should dissolve the second house and just have panels of experts for each subject which can be called before the commons. The power to block legislation doesn’t fit the criteria of ‘panel of experts’. What always frustrates me about these reform discussions is that people aren’t ready to start with criteria and then design a system around that criteria – they start with a design (whether they take a conservative stance in supporting the current system or favour some other system) and then they look at the systems they oppose and find criteria that it doesn’t match to force opposition to it. So we get the ‘we can’t have PR, because we elected an executive with FPTP’ – if your criteria is that a system is there to elect an executive (what some people refer to as ‘the elected dictator’ system), then you create either direct elections or an electoral college system. If your argument against HoL being elected by PR is that it would give the HoL too much power, then you create constitutional reforms which limit the power of the second chamber. The arguments are always to create a patchwork system, which are doomed to fail  like we currently have or to disingenuously oppose any reforms. Any system that is built to do something it isn’t designed for is always doomed to fail – going back to the ‘FPTP elects governments.. except when it doesn’t’ is case in point – the system works, except when it doesn’t. It’s doomed to fail at criteria it’s not designed for. Agreed. And indeed though London tried spuriously to claim that theirs would be a “green” Olympics, it was always the French who were the only ones doing significant recycling (of facilities), a fact which counted against the French in the warped mindset of the IOC. Hang on. France was three months away from a presidential election at the time. Here, we’re still nearly three years away from a general election. I think 1992 had the special circumstance that we had previously a decade of boom based on property speculation. The bust that followed at the end of that decade merely raised the hope of a recovery in the minds of ‘new tories’ as I well remember my new (new to me) neighbours saying to this ex-pat returner. The 1992 election was an expression of wishful thinking IMO, especially south of Watford. Remember that grinning chap in Dagenham? So I think the general principle is good and could play out again in 2015 if a similar ‘want to feel good’ factor applied. I am with you plenty of time, one of the lessons of 1992 was too many detailed policies too early. One difference is that there is a possibility (imo not likely) of an early GE so Labour have to have some policies up our sleeves just in case. I think we need some vague commitments at this years conference fleshed out a little in 2013 with firmer positions adopetd in 2014. You could take exactly the same set of polling data and make an equally credible argument that support must be pretty firm, on the grounds that the underlying disposition towards Labour must be even stronger, being held back only by Miliband’s personal ratings. I remain unconvinced by either hypothesis, for that is what they are in the absence of supporting evidence. Even though the points in your thread are qualified, the logic still seems to lead to a conclusion that if Miliband’s personal ratings remained unchanged but Labour’s lead disappeared, this would make his position even more secure because with such success it could no longer be argued that he was a significant drag on the ticket. And that conversely a 20% Labour lead in the same scenario would demonstrate irrefutably that Miliband was a failure and could await only the prospect of a leadership challenge. And I agree with you that Miliband need to be judged in terms of the impact of his leadership in terms of strategic decisions and direction, rather than solely in terms of public perception. And one of the best of those strategic decisions has been the one to replace Byrne with Cruddas in overseeing the development of detailed policy. Whilst sharing your general cynicism about the modern Olympics & the circus of commercial exploitation , & privileged access which they seem to exist for-your statement does need challenging. Peter Ueberroth writes in today’s Times about the 1984 LA Games. He was President of it’s Organising Committee. After the financial debacles of Montreal, which followed Mexico City & Munich, competing bids were virtually absent for 1984. A group of volunteers organised the LA Games , with no taxpayer funding, using rented stadia & campuses. Funding was a record-breaking TV rights deal. 1984 LA made a profit of $240 million, part of which is still funding US Olympic teams-including those coming to London. Ueberroth says their model for LA 1984 was the austerity Olympics of 1948-in London. The accounts of those games-held just after the war, with virtually no money available, in a nation where food was still rationed -on radio & in the papers recently have been eye opening. Getting back to today’s approach, I heard an Olympic athlete on radio this morning saying that control of so many things by sponsors is inevitable -because without them there would be no games. …..in other words , they failed for being archetypically French ! as quoted by Con Home. mmmm-how has the old chap managed to cope for two years , surrounded by all those macho Tories ? Sounds like that nice non-macho Ed Miliband holds some attractions for old Vince. …..and he wouldn’t be working with an “opponent” either. Just remember what we saw in 2010: a steady movement from LD to Labour in support. It did not seem to rush back as soon as EM arrived in charge, nor has it since in any great numbers. okay, he did not get a honeymoon. These are not obligatory, and unless your surname is Blair, they never last long enough to win very much. I agree with you, that may be a weak part of the argument. The apparent solidity of Labour’s VI derives from the unpopularity of the Tory government, and the unpopularity of the LDs for supporting it. I think there is also an element of the refresher course for those with a short memory about it too… an unwind of the 11.5% swing (2010 GE)* to Con among 18-24 year-old females/25-34 males for instance. Unless there is a very energetic break-up of the LDs, with a section of their MPs becoming Tories, and the rest taking a resolutely left-of-centre stance – Labour’s current VI could hold up reasonably well, however, the genuinely floating don’t knows/not well informed could be swayed either way in best Prime Minister stakes closer to the election. The seven point plan includes a proposal to allow mass membership organisations – such as the CBI, TUC, General Medical Council or even the RSPB – to elect their own peers. I’m guessing that they’ll pick the organisations now & that’ll be it cast in stone. There won’t be any ‘right’ to be included just because you’ve got loads of members. I mean, I wouldn’t qualify as a mass membership organisation by having 6 million UK* facebook friends, would I? * Presumably it will be based on UK membership of organisations. I can’t see Cable winning a leadership election of his party – but it’ll be interesting to watch him try a coup of Clegg if it comes to that. I suspect if he tried, he’d be left humiliated – although where he goes from there could be interesting. I’d imagine in a fractured LibDem party, most of the ministers and MPs would stick with Cameron – but would that mean Cable and co are absorbed back in to Labour? “I found this wirednewyork London thread – page 9 has some pics by Codex of various architectural styles, Georgian and Regency through to Victorian and Edwardian. There are are also some stunning photos on the other pages. Thanks. Ironically, the Georgian and Regency style homes are more similar to what we term as “Victorian.” Those are some beautiful photos though I don’t get why that one dude has to trash NYC. American downtowns are unique and have their own architectural and cultural place. I think timber buildings are forbidden by LA City Code or possibly state code. I’m willing to bet you though that those buildings I showed you pics of are not constructed of timber but instead merely have wooden siding for decorative purposes. I think that’s true of a lot of the craftsman style homes in CA. I was sad when I visited the Painted Ladies in San Francisco. They look so beautiful in the pictures. They’re the iconic photo of San Francisco and going to see them was at the top of my tourist to-do list. Up close though, they’re not all that pretty and kinda run down. And the neighborhood gave me the creeps too. This is what people think of him now, imagine how much more experienced and better he will get in three years time. He has even won over the Blairites. This Ed article is certainly topical; today’s Telegraph politics section has 2 articles about ‘our’ Ed. Unite Union want Miliband to fight a ‘class based campaign’. Miliband has earned the right to be heard but what will he say? “Peter Ueberroth writes in today’s Times about the 1984 LA Games. He was President of it’s Organising Committee. No city had ever made money off of the Olympics prior to 1984 (except on one previous occassion, the 1932 Los Angeles Olympics, and then the profit was small and in some ways questionable). But after we made a ton of money, everyone and their mother wanted the Olympics. That’s why today, it’s not sufficient for a group of volunteers to self-organize and attract the Olympics but a major financial commitment from the government and major organization is needed to attract the Olympics. And btw, after we got the Olympics, the city spent massive amounts of money on the protection and other associated costs for the Olympics. So the idea that it was all privately funded is a myth. What’s this? Ed Miliband a lunchtime guest on Test Match Special, interviewed by a fawning Jonathan Agnew, and then caught by the Sky TV cameras enjoying his day out at the cricket. Is this his early bid for those legendary middle England votes? I think those comments signaled a) his allegiance-ie Labour not Con.-& b) his view that his experience trumps his age. You could imagine a VC leadership bid after a GE in which LDs get slaughtered-building the party back on it’s true ( left) foundations etc etc. …but I wonder if he is more ambitious than that? Assume the coalition formally breaks up some time before the next GE to facilitate separate preparation for it. A move in that window of time by VC-to take the party left-away from those “macho tories “-attempting to retrieve some of the defected-and positioned ready to join a Lab Lib coalition if the opportunity arises. Presumably the time required for LD party processes vs the pre GE time available outside the Coalition would be a key factor. Either way-I think he could well be successful . Apparently Nick Clegg, in an interview with The People (part of the trinity mirror group and published tomorrow) said that he would go in to coalition with Labour in 2015, under the leadership of PM Miliband. Perhaps this is the start of a narrative shift for the whole party, toward the left, to try to win back ex-Lib-now-Lab voters? I wonder if NC has the “credentials” to lead LDs into a coalition with Labour. As you say, there are signs of thinking about 2015 here. It’s all a bit premature for my taste-the Parliament is only half way through-are LDs intending to sit on their hands for two years until they leave & start courting Labour? I can see this positioning by Clegg & Cable getting right up the noses of Cons who think there is still work to do. Yes-that has been painfully obvious since the last GE. Extraordinary that he has held high office in this Coalition with his allegiances . IMO, Vince is putting a shot across Nick Clegg’s bows – namely, if Clegg is starting to think about an electoral pact with the Tories, he should just stop right now! I think Labour supporters would leave in droves if Lab went into coalition with Libs with NC as leader. Unfortunately they would be homeless as there would be nowhere to go. Do think anybody will believe him? Won’t they just think: He’ll take our vote & then find a way of justifying another coalition with his ‘friend’ Dave? The ..low construction costs, coupled with a heavy reliance on private corporate funding [for the two venues that needed to be build], allowed the Games to generate a profit of more than $200 million, making them by far the most financially successful in history. I suspect that the very fact it was in LA meant that it was easier to get the high rates for media and sponsorship. But maybe I should have said “all recent” games as the LA Games were 28 years ago – the general point is true enough however. I too would have loved to have seen a 1948 style games. I don’t actually think the athletes would mind terribly. It’s not them who expect the pampering, it’s the IOC and big corporations who want the lucrative contracts plus all sort of perks for their overpaid executives. Fun fact – Romania came second after the US in the medals table. Maybe there should be an article on whether Nick Clegg is a drag on LibDem support. But does anybody care? Whilst I agree with your sentiment the maths will determine if a Clegg led LD party could coalesce with Labour. It may seem unlikely at the moment but should the LDs win 40 seats or so in a reduced House of Commons Clegg may well stay as LD leader and Labour may need them to govern with no power to demand he goes. Finally get round to posting on the headline topic after a new thread starts. I must say I have a few doubts about the idea that Miliband is in particularly bad situation, comparable to IDS. There are several reasons for this but the main one is there are no comparable figures here for a Labour leader in opposition. The underlying assumption is that Conservative and Labour leaders should always get similar patterns of support. But core Conservative voters usually show tremendous loyalty to their leaders, especially in office, while Labour supporters are often more conflicted. This is bound to distort the headline figure. But as we know voters are not necessarily rational. The baggage that Clegg carries will not be acceptable. So Labour may need LDs even with Clegg but they will lose supporters. Roger – obviously there are no YouGov figures for Labour opposition leaders and MORI asked the question only very rarely in the immediate run up to elections. The best we have for Best PM back then is Gallup, and they have a similar pattern of opposition leaders doing worse in the Best PM question than in voting intention, but by different amounts. Smith and Blair had a much smaller gap than Miliband, Kinnock about the same size gap as Miliband. Of course, around 1992 and 1997 Gallup’s VI polling was a bit ropey, never really correcting the problems of 1992, so I’m not sure how solid it is. Ed polling might be sa bit low because he has not had too much exposure yet. The closure the election is, the higher exposure he will get, which could have a very positive impact on his personal ratings, especially since he seems to be learning from his earlier errors.